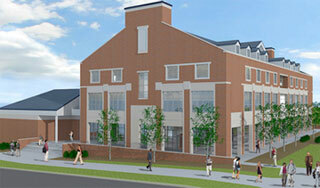 Profile: The three-story North Classroom Building is a highly collaborative, hands-on, interactive learning space. The building is comprised of 14 classrooms that seat 30 to 48 students each, and two 125-seat auditoriums. All the classrooms have multimedia equipment, and the entire building is wireless. The first floor features a café and Student Success Center. The third floor is a work area for faculty. Services: DataCom Design Group's consultants worked closely with the owner and the design team to provide technology design for voice and data IT, wireless, audiovisual, CCTV, security access control, and acoustics.